OK, here is my first request for info, does anyone have any images or colour schemes for the Russian Lend-Lease P-47's as they apparently received between 190-205? 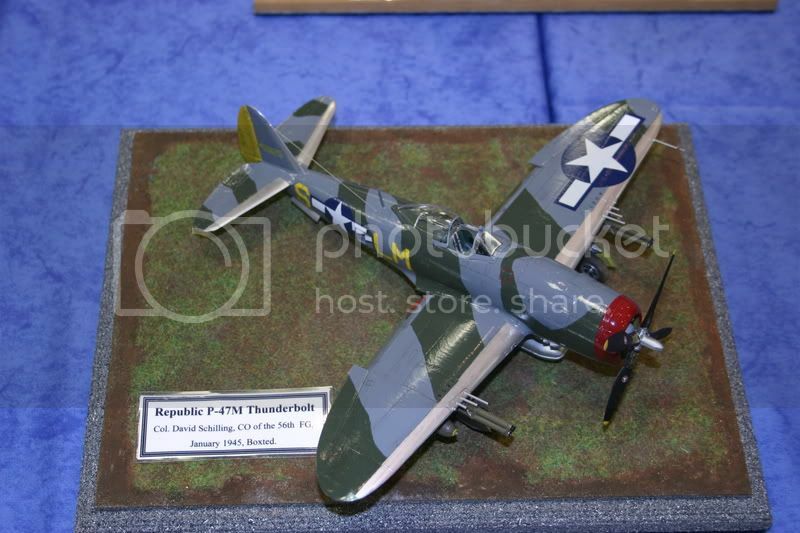 Also, I remember somewhere mention of a black RAF P-47 with a red lightning stripe along the side? Any info on that? I have photos of the Russian P-47's at home, and I also have colour profiles and I believe one or two photos of the RAF T'bolts with the red stripes. They look very cool! 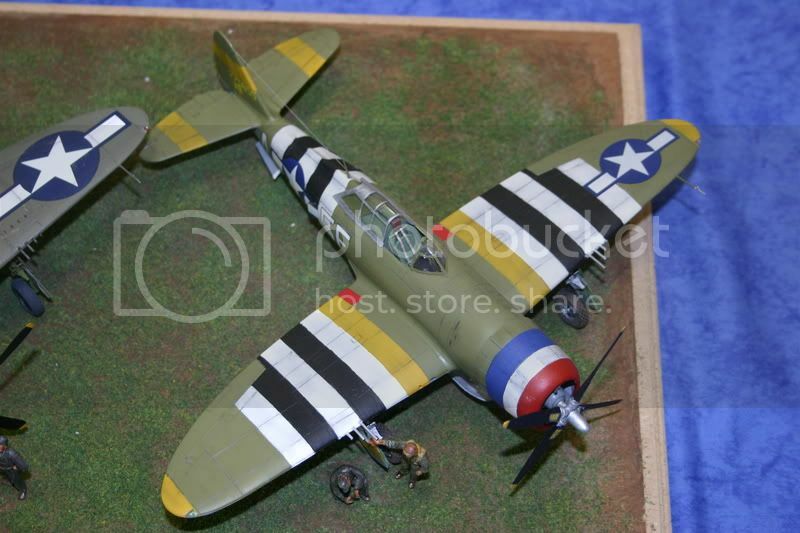 Andy Brazier recently built a Soviet P-47 and will fill you in with the colour scheme when he reads this. They were Russian colours. The bad news is that I wont be home until Oct 30th as Im in the middle of yet another tour, so I wont be able to scan the photos. Hope your not in a hurry!, but let me know if you are and I'll see what I can get together for you. Once again you guys come thru. I'm going to be going with 'rabbit' I've got the doco you mentioned so I'll be having that on while I build. Do you know if any other special interest groups in the pipeline? I dont know of any other SIG's just yet, but what I do know is that the P-47 SIG is very close to going to another level. Work is underway behind the scenes, and I'm hoping to be in a position to make a very special announcement in the near future. Its a shame Bob Rankins plane isnt featuring on any decal sheets at the moment, but with the continued interest in the 56th hopefully it will appear again in the future. Happily, Shorty Rankin is still with us, and is well over due for an appearance in the SIG. Lets rectify that right now. The RAF P-47's with the lightning strike were flown by 73 OTU in Egypt post war. Heres a profile for you. I have also seen a profile showing the T'bolts with a white lightning strike. Im sure I have at least one photo of 73 OTU P-47's at home and if you remind me I'll scan and post when I make it back to the ranch. 73 OTU also operated P-47s with the Ace Of Spades on the cowling, which is one of the decal options in the VFS bubbletop. From what Ive found in a quick search today, the Russian planes were operated by the 225th IAP. The bubbletops sent over were from the D27-RE batch. Excellant Nige, just the thing. Thanks! I'll keep waiting for the decals and hope someone makes them soon. At my current rate I will be ready to apply them in about a year. Thanks for the replies. ...some great pics posted on this page Nige ! The 86th was a colourful group - Eagle Editions have produced a nice hardback on this unit recently - but no decal sheets !!! Allways good to revisit the stash, especially if it has been so long you forget what you have in the Thunderbolt model line, but my main stash resides in a lock up storeroom 20 minutes drive away from my home so that's my excuse. Most of it has been there 11 years now as I was overseas for seven of them so I occasionally am suprised by what I find. 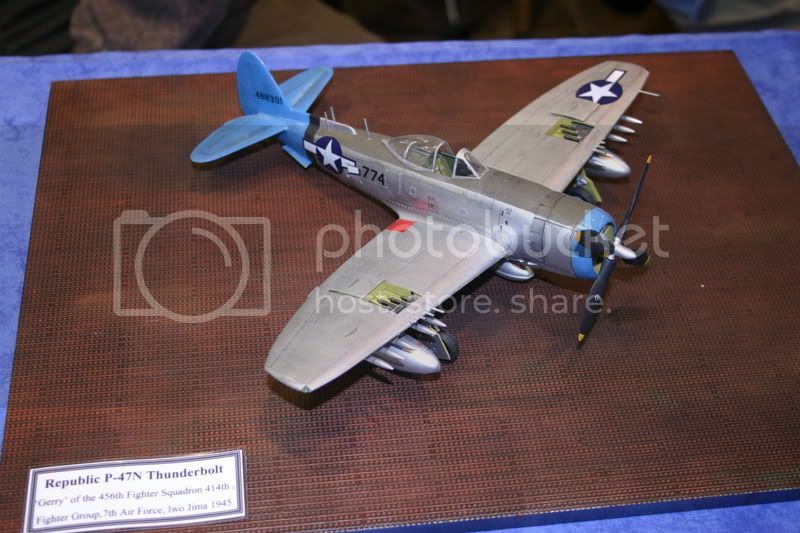 I went looking for a 1/72 scale Lancaster but found four Thunderbolt models as well. First was the 1/32 scale Revell Bubbletop that I built back in the Seventies that is now a bagfull of parts, but at least they are all there so that one is ripe for a rebuild. Next an Arii 1/48th scale Razorback with a pair True Details resin mainwheels tucked in the box. 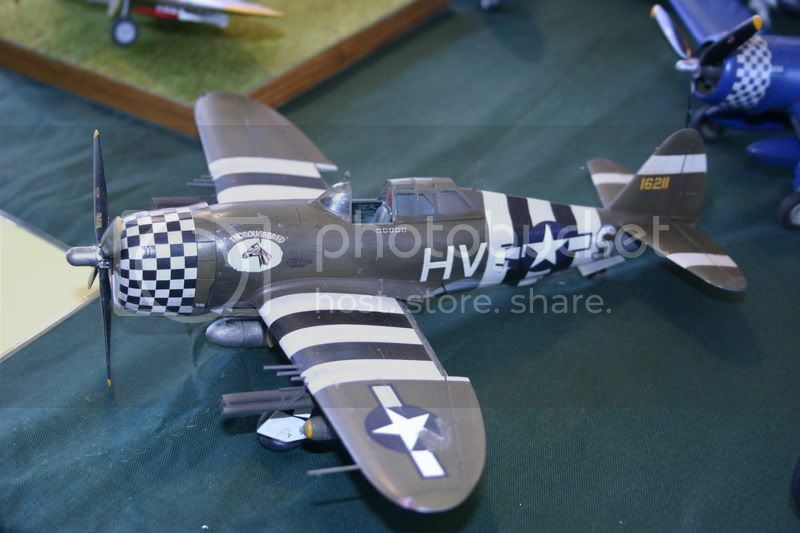 I like the Arii kit and to me it still looks good as a representation of the P-47. You get a lovely pair of full colour profiles of two of the decal schemes in the box as well including the recently discussed 73 OTU one, a nice bonus. The 1/72 Hasegawa Razorback also still looks good in the box with it's Fiery Ginger IV markings as an alternate, probably the way I would go. Finally in this batch comes one for Lampie, the 1993 Monogram Bubbletop Thunderbolt "High Tech" edition with only one colour scheme to choose from Col. Schilling's "Hairless Joe" from the 56th FG. Proving yet again how nice the Monogram P-47's are in the box with the added bonus of quite a usable photo-etch set thrown in the box. Thanks to Neil Page for sourcing these photos and sending them to me for inclusion in the SIG. Frank Careys T'bolt. 73 OTU Egypt Nov 1944. Please feel free to contribute photos and answers to reference questions everyone. Dont feel you have to wait for me to answer Especially at times when Im away from my references and on tour. Do however, take as much care as you can to ensure that your information is checked for accuracy before posting. 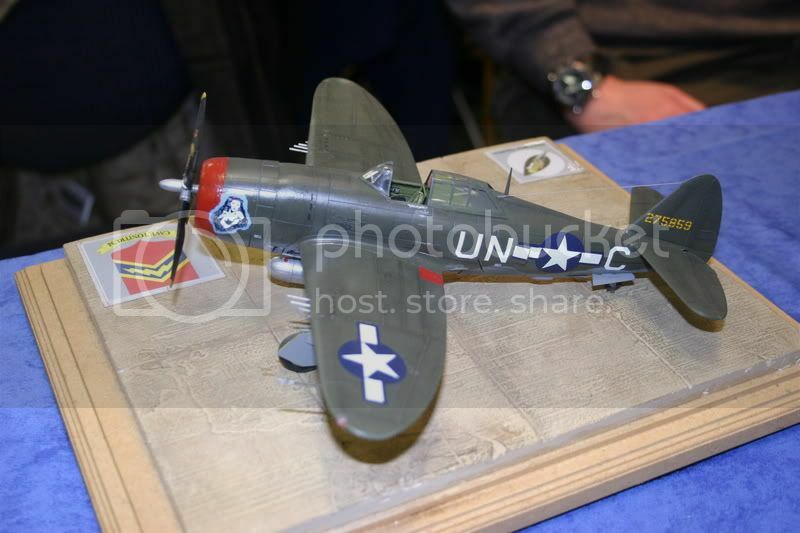 I got the scheme for the Soviet p-47s from the Wings Palette site, thinking its not a usual marking seen on P-47s and will look a bit different from the usual olive drab/ NMF P-47s we are used to seeing. If my memory serves me correctly I used WEM's Soviet range of enamels, with AMT-4 VVS Olive Green uppers and VVS All Blue lowers. The markings I nicked from another kit apart from the codes which were hand painted (badly) on the tail. Here is a attempt at a photo shopped pic of my Ruskie P-47. I have to say the tonal values in the 73 OTU Thunderbolt's lightning flash certainly match the red of its roundels, to the point I certainly believe it was a red flash rather than white or natural metal. Check out the size of the upper wing roundels as well! Yep,its certainly a red lightning strike on this particular aircraft I believe, although i have seen it stated that it was a natural metal stripe.I wonder if there were more? Records show that 5 were delivered to Alexandria and there is apparently a colour photo of the the starboard side of this aircraft showing the stripe to be Natural metal but I cant find it. It may be a profile as oposed to a photo. Personally I favour the red. As for the oversize roundels,,looks like a job for Miracle Masks! 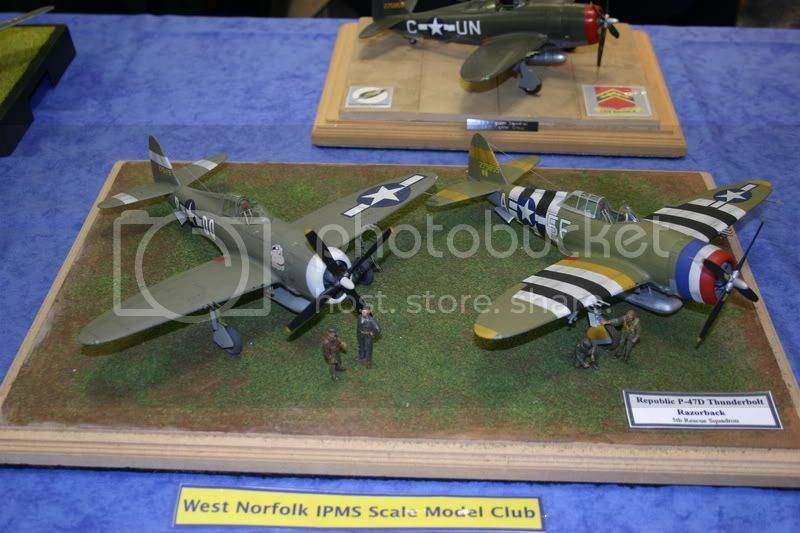 While at Newark Model Show this weekend I came across one stand that had an impressive array of Bolts. So I took some photos for everyone pleasure. Enjoy. 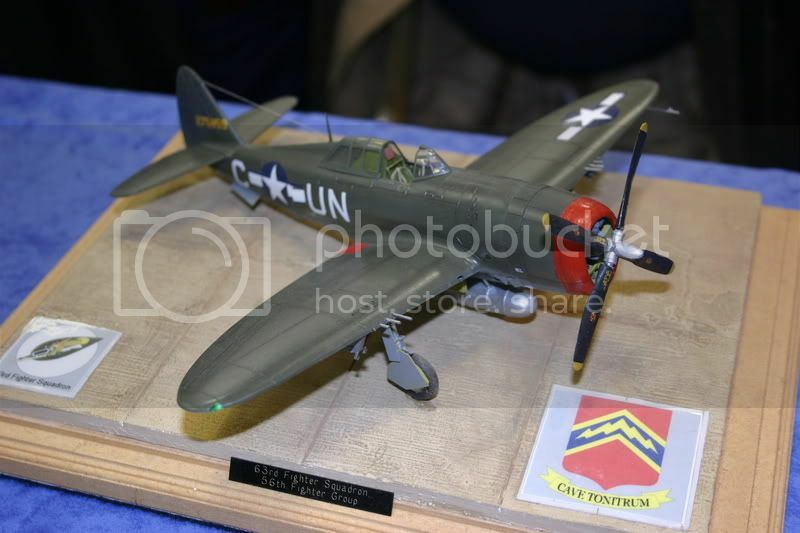 Miss Dallas was a P-47D-1-RE (42-7876) and off the top of my head, ( away from home for another 3 weeks, no references etc etc ) would have been factory fitted with the 12'Curtiss prop and more than likely recieved the Curtiss Paddle Blade prop as a field modification. Looking at the photo I posted it appears to show the 12' Curtiss. The guy who builds those also has a couple of models in the museum at Halesworth. 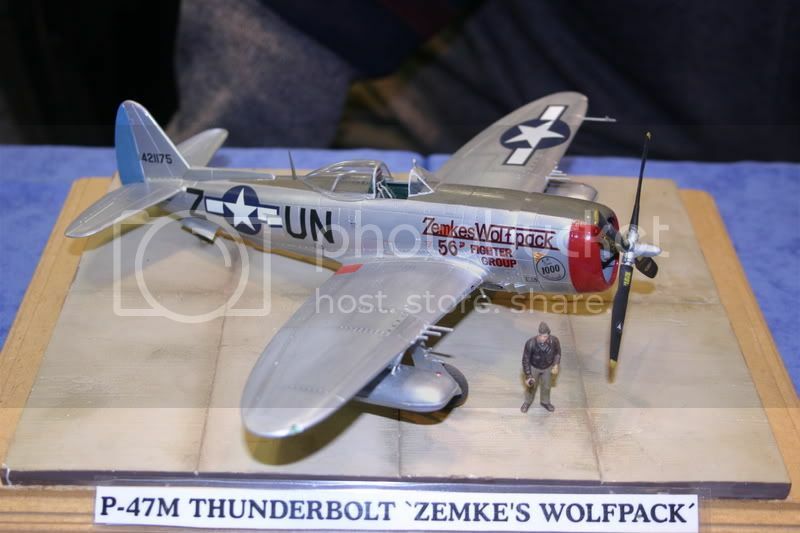 Is the "Zemkes Wolfpack" M the Hasegawa 1:32 one? Nope,i seem to remember that they were all 1/48 scale. These were all the ones that I found at the show. but I'll keep on snapping away if I see any more at the IPMS-UK Nationals in a months time. about Soviet P-47 here's a link that you may find inteesting. Thanks for posting that Jean. Here are a couple of links on No. 73 OTU and their Thud's. This photo would suggest white/silver. Though having said that if you campare the flash to the white outline to roundal they are not the same. P.S. You going to buy the VFS Thud? I agree that the lightning stripe definately has a darker hue than the white area of the fin flash. 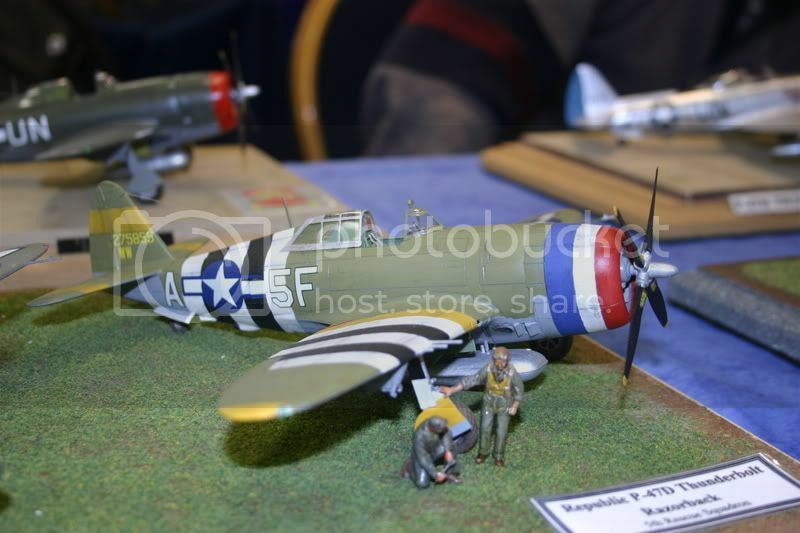 I have the VFS P-47M on order.It should be released in November. 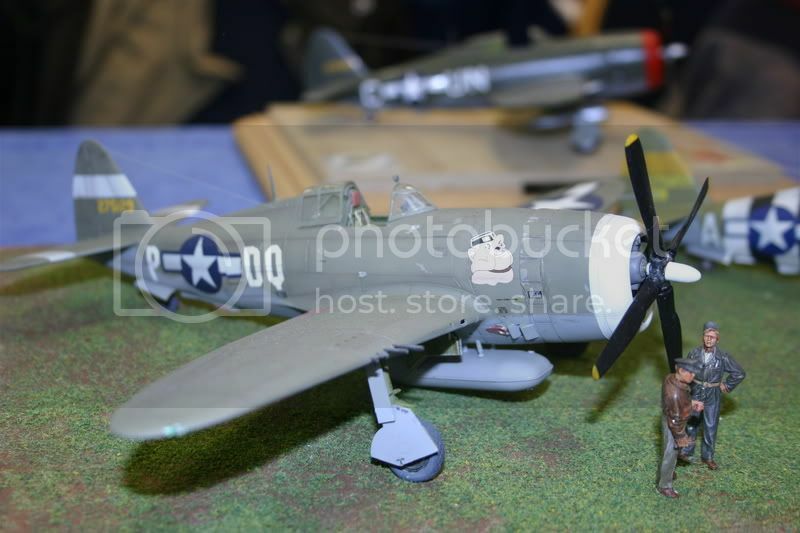 Russ Kyler who piloted the box art subject "Lorene" was very involved with the research, and it looks as though the VFS release will be the first time the Lorene noseart has been accurately produced as a decal. Im in regular contact with Russ and will be documenting the build for him. Just reviewing the 73 OTU photos. It seems that the photo Ross posted and the first one in the post that Neil posted are the same photo but Ross's copy is over exposed in comparison to the earlier one, which makes the lightning stripe appear lighter in colour.